Allen Octavio Córdoba...he and his wife, Alison, have a daughter, Allishka. 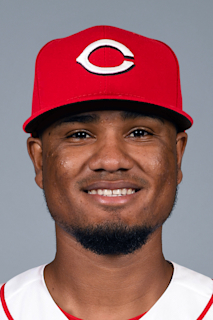 Made his first career Opening Day roster and his MLB debut on 4/3 at LAD, playing in 100 games and recording eight extra-base hits, 15 RBI and 17 runs scored... Selected by SD from STL in the first round (third overall) of the Major League phase of the 2016 Rule 5 Draft on 12/8/2016... remained with SD for the duration of the season... Logged his first career hit on 4/8 vs. SF and his first career home run and RBI on 4/17 at ATL…his first career homer was hit as a pinch-hitter off of LHP Jaime Garcia... Recorded a career-high three RBI on 4/29 and a career-high three hits twice (5/12 at CWS and 6/2 vs. COL)... Over 23 games in May, he hit .308 (20-for-65) with one double, one triple, one homer and three RBI…hit safely in a ML career-high six consecutive games from 5/24-29, batting .346 (9-for-26) in that span... Made 42 starts on the season, including 24 in left field, 15 at shortstop, two in center field and one in right field while also making three appearances at third base and one at second base... Following the season, played in 17 games for Naranjeros de Hermosillo of the Mexican Winter League and hit .236 (13-for-55) with one double, one home run, two RBI and nine runs scored. Spent the entire season Rookie-Level Johnson City and led the Appalachian League in batting average, hitting 362 (71-for-196) with 16 doubles, five triples, 18 RBI, 49 runs scored and 22 stolen bases in 50 games...Earned Appalachian League Post-Season All-Star honors and was named to the Baseball America Rookie All-Star Team...Opened the season hitting .259 (7-for-27) through his first seven games in June...went on to hit .379 (64-for-169) over the remaining 43 games in July - September...Recorded a career-high four hits on two occasions...compiled three three-hit games and recorded 20 other multi-hit efforts...Compiled a 14-game consecutive hit streak from 7/18 - 8/4, hitting .441 (26-for-59) with 17 runs scored, eight walks and five stolen bases over that span. March 5, 2019 SS Allen Cordoba assigned to San Diego Padres. November 26, 2018 San Diego Padres sent SS Allen Cordoba outright to El Paso Chihuahuas. November 20, 2018 San Diego Padres designated SS Allen Cordoba for assignment. October 2, 2018 San Diego Padres recalled SS Allen Cordoba from Lake Elsinore Storm. August 18, 2018 Lake Elsinore Storm placed SS Allen Cordoba on the 7-day disabled list. July 1, 2018 San Diego Padres optioned SS Allen Cordoba to Lake Elsinore Storm. July 1, 2018 San Diego Padres reassigned SS Allen Cordoba to the minor leagues. June 11, 2018 San Diego Padres sent SS Allen Cordoba on a rehab assignment to Lake Elsinore Storm. April 3, 2018 San Diego Padres transferred SS Allen Cordoba from the 10-day disabled list to the 60-day disabled list. Concussion. March 28, 2018 San Diego Padres placed SS Allen Cordoba on the 10-day disabled list retroactive to March 26, 2018. Concussion. December 12, 2017 Naranjeros de Hermosillo placed OF Allen Cordoba on the reserve list. November 21, 2017 SS Allen Cordoba assigned to Naranjeros de Hermosillo. November 21, 2017 Naranjeros de Hermosillo activated OF Allen Cordoba. December 8, 2016 San Diego Padres claimed SS Allen Cordoba off waivers from St. Louis Cardinals. June 22, 2016 SS Allen Cordoba assigned to Johnson City Cardinals from GCL Cardinals. June 22, 2015 SS Allen Cordoba assigned to GCL Cardinals. April 28, 2013 St. Louis Cardinals signed free agent SS Allen Cordoba to a minor league contract.